A collection of works in the field, including water colours and acrylics 2018. 15 November 2018 with Meet the Artist on Saturday 17th at Micthell at Micthell Fine Arts in Brisbane. 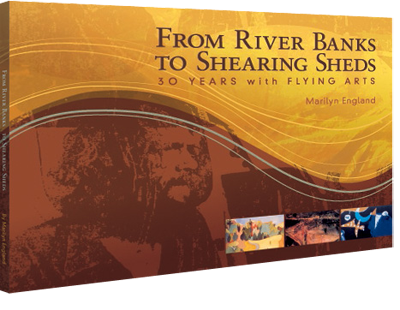 It is 45 years since the first flight of Flying Arts, through a retrospective exhibition of artworks by renowned artist, teacher and the founder of Flying Arts, Merv Moriarty. An exhibition launch and public programs will accompany this exhibition. 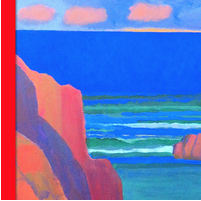 View artworks spanning more than five decades, including early works painted in Brisbane during the 1960s-70s. A recently completed series will also be exhibited for the first time. 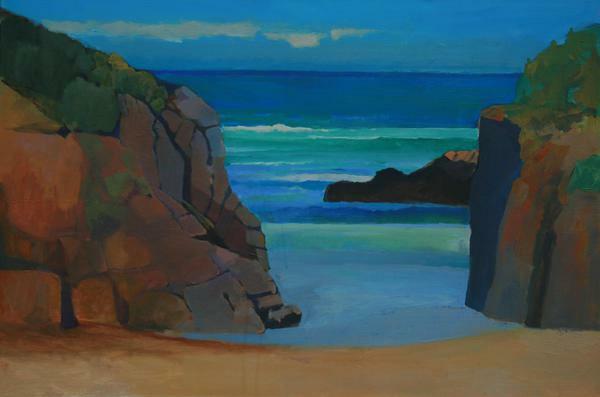 Primarily working with the figure and landscape, Moriarty has remained committed to expressing his individual perception of lived experiences through his masterful understanding of colour relationships, composition and form. This exhibition provides a rare opportunity to experience a snapshot of Moriarty’s artistic oeuvre, and charts his extraordinary career through his art practice. "If I have been enamoured of colour in the past, I am in awe of it now. Colour relationships speak and, I trust, reveal things about life that have yet to be written down. I feel an obligation to respond to this at a very deep level." As part of the 40th Anniversary celebrations Flying Arts founder Merv Moriarty will be conducting a 'soft launch' of his new book COLOUR - the definitive guide on Monday 21 November, 2011, 6.30pm - 8pm at Art Shed Brisbane. Merv will present his new book and discuss and illustrate his innovative theories and ideas about colour. For more information about this event, call Art Shed Brisbane on 07 3846 1330. Click on the image below to download the printable PDF [393KB]. 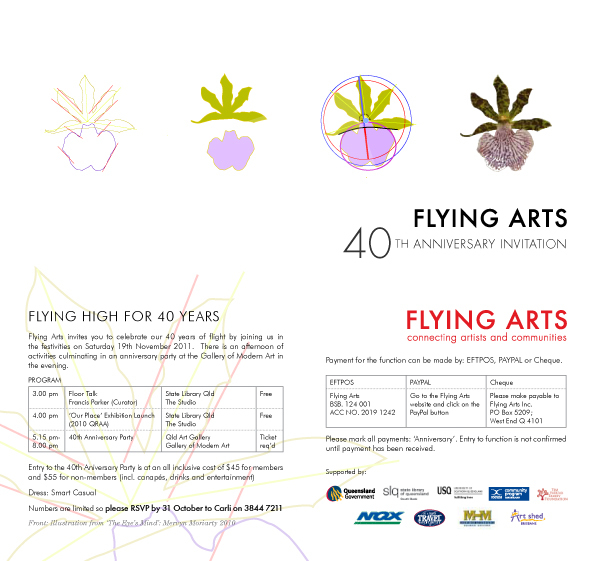 Merv will be giving a series of workshops in Queensland in early February, 2011 to coincide with the 40th anniversary of the founding of Flying Arts. More details available soon or visit Flying Arts Inc. In 1971 Merv Moriarty founded the Flying Art School, first known as EastAus Art School. Above is some old footage from 1982, produced by the ABC, showing Merv flying his light aircraft and some of the art classes that took place in remote parts of Australia. 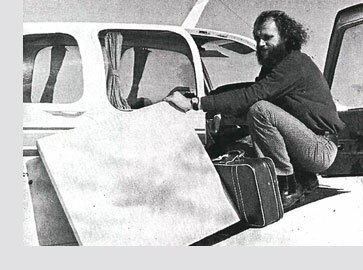 On September 24, 1971 Merv Moriarty took off from Brisbane’s Archerfield Airport "with his newly acquired unrestricted pilots licence" on a 6,000 km solo flight to towns and centres along the coast north to Cairns, west to Mount Isa, returning to Archerfield via Longreach, Charleville, Roma and many smaller centres along the way. This was the beginning of the flying art school that he had worked toward for ages and the purpose of this first flight was to talk to representatives from the many towns and districts along the way, to tell them about his plans for the flying art school and to judge from their reaction, the viability of this school. The reaction was enthusiastic and EastAus the flying art school was born. The following is his story of the creation and development of the early years of the Flying Art School. I have decided to take up the challenge of writing down my memories of all the pain and the joy of my years as 'The Flying Artist'. It will take time, years perhaps so I will do a little, piece by piece, when I can manage to find the time and the courage to revisit this part of my life. Some of you visiting this site from out there somewhere, may have attended flying art school workshops, or you may have been one of the few dedicated people who helped my then wife Helen and me to get it started. If you are one of these people and you would like to add something to the story please get in touch, or write your experiences down and send them to me. You can email me directly through the Contact Us section of this website or make some comments on Merv's Blog. My wife Helen had just dropped me off at Archerfield Airport. It was one of those beautiful days that we always hoped for when we had something big to do more so, when the thing we were going to do is made much harder in bad weather. I loaded my luggage in the rear compartment and back seat of the aircraft I had hired from the Royal Queensland Flying School. It was with this school that I had done my flying training and the plane I had hired for the trip was one with which I was quite familiar, having flown it on many of my training flights, on my test flights and on the five hour solo cross country flight that all pilots must do as the final test before receiving their unrestricted pilots licence. By the late 1960s I had established myself as an artist and an art educator and was asked by the Queensland University to conduct classes in visual studies for the Architecture Department. I was also asked by the head of the Australian Arts Council Queensland branch Dr Gertrude Langer to conduct workshops for the vacation schools at the Queensland University. Dr Langer also asked me to conduct workshops for the Arts Council in some isolated centres in Queensland. In response to expressed need for the opportunity to have access to good quality art education by many of the students who attended these workshops I came up with an answer to their needs in the form of the flying art school. But there is more to this part of the story and I will endeavour to get back to that. In order to get the flying art school up and running I had to train as a pilot, gaining an unrestricted pilots licence I set about forming the flying art school (called EastAus Art School). I filled in my flight plan for the first time without an instuctor or testing officer checking it out, and handed it in to the man behind the counter at the Archerfield Flight Centre. I started the engine of the aircraft for the first of the flying art school trips with that queasy feeling that we get when we are under the equal and opposite influence of two powerful sensations, one of great expectation, the other, great trepidation. I returned from that trip a week later utterly exhausted but excited about the possibilities of the flying art school. Somehow I seemed to think that all the effort of getting the school going was over and it would become easier from here. Oh dear! Over the years of my commitment I wrote a series of 23 books of lessons to provide written technical information and established a visiting schedule that included some 26 centres over a distance of thousands of kilometres. I visited each centre four times a year. The story of Flying Arts, once called "The Flying Art School" and founded by Merv Moriarty.